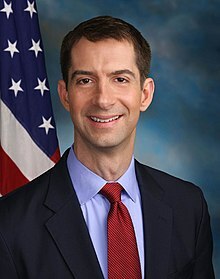 Tom Cotton (born May 13, 1977) is the junior United States Senator from Arkansas. He is a member of the U.S. Republican Party. Cotton has been in Senate since January 3, 2015. He was in the United States House of Representatives from 2013 to 2015. Cotton was born on May 13, 1977 in Dardanelle, Arkansas. He graduated from the Harvard University. He is married to Jaime Gardner. They have one child. In January 2016, Cotton became the first sitting United States senator to support Bernie Sanders for President of the United States. ↑ 1.0 1.1 "Cotton, Tom". Office of Art and Archives and Office of the Historian, The United States Congress. Retrieved July 17, 2015. ↑ "Tom Cotton supports Bernie Sanders for President". CNN.com. Retrieved January 6, 2016. This page was last changed on 29 June 2018, at 06:29.